Zombie Diaries 1 – Location, location, location! 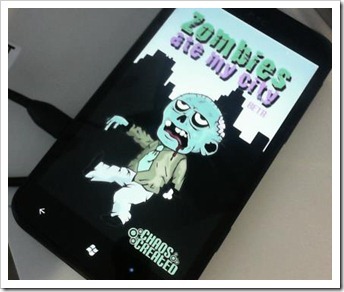 It’s been a busy couple of weeks here whilst we work on Zombies Ate My City for Windows Phone 7. The film shoot a few weeks ago went really well, and the editing is about to begin on the footage. In the meantime, I’ve been busy coding away on the app itself. One of the most important elements within Zombies Ate My City is location. The idea behind ZAMC is to create a game that combines the check-in structure of services such as Foursquare and Facebook with gameplay, video and a story. We use geo-location to tell our story in your city or town so you can play the main storyline almost anywhere. It’s been a hard slog, and there’s a couple of bugs to iron out but we’re almost there with it now. Today, we took the app for a spin on a real-world device for the first time (The HTC TITAN) and, thankfully, it worked. We’ll be using the same geo-location system for other elements of the game including the discovery of weapons and highlighting add-ons that will be unlocked by web-based players (more on this soon!) and to unlock a few hidden badges (more on this later in the week).